Situated at Bukit Peringgit, the Toh Puan Zurina Foundation was established in November 2009 as a haemodialysis centre in Melaka that offers dialysis treatment for low income kidney patients. 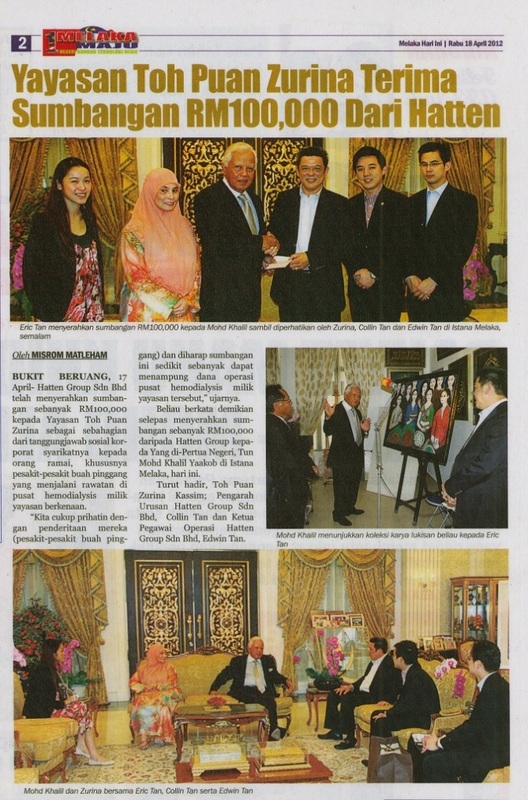 This dialysis foundation is named after the Melaka Governor Tun Mohd Khalil Yaakob’s spouse, Toh Puan Zurina Kassim. As part of a corporate social responsibility program, in April 2012 Hatten Group contributed RM 100,000.00 to the foundation realizing the concern to kidney patients who are undergoing treatment. With the arising cost of kidney treatment, it is hoped that this recent effort can help reduce the burden on those patients who are unable to bear the high treatment expenses. What they did is wonderful. We have to help others if someone is in need. I’m sure that God has planned this, He used this foundation to help others. I’m so proud of you. This entry was posted on August 14, 2012 by Hatten Cares in Hatten ♥ Community.